After all of the struggle to find any DK/Sport weight yarns that would work with my Argyle Crochet technique (still haven't found any), I got it in my head that I should just dye my own variegated yarn. 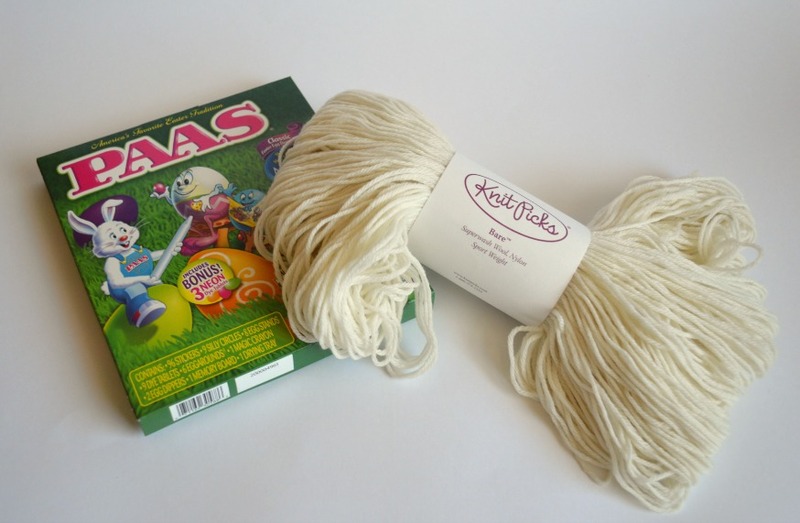 So I went online and ordered some gorgeous superwash wool/nylon blend yarn from KnitPicks, and I got a dying kit and a book on dying techniques. I discovered that the precision that I was going to need to make evenly spaced variegations was going to be WAY too hard for me (a first-time beginner! ), so I decided instead that I would just play around and experiment. I went searching for some awesome videos on YouTube. 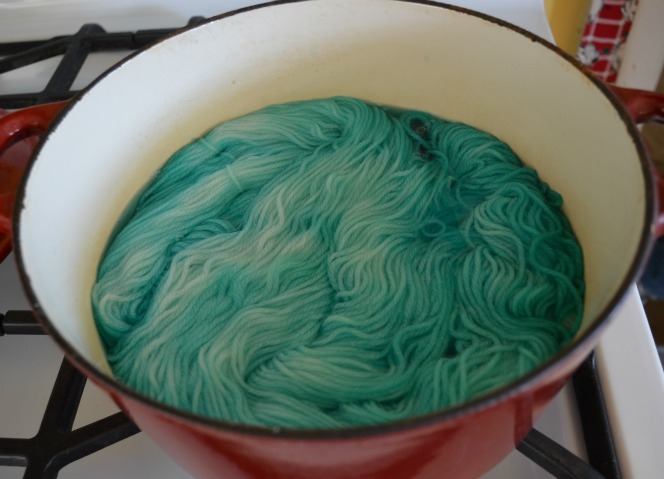 The yarn that was being dyed with food coloring was too cool! I watched, like, fifteen video tutorials in a row. Oh my goodness, I was having so much fun I felt like I'd opened Pandora's rainy-day craft box!!! And I hadn't even dyed anything myself yet! For my first experiment into dying my own yarn, I decided to use (10-cent clearance!) egg dye pellets with my yarn. It meant that I could use my regular cookware (no non-food chemicals!) to dye the yarn right on my stove! Awesome! I wanted to follow this ChemKnits tutorial exactly! Her yarn turned out so beautiful, and it was just the colors that I wanted. 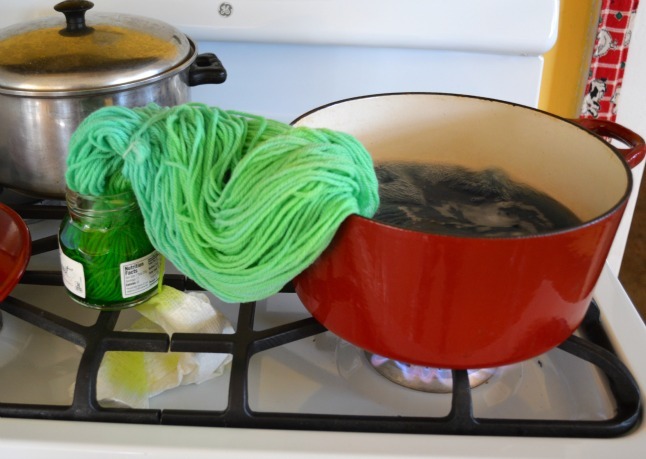 I grabbed my box of egg dye and my yarn and headed to the kitchen to play! Egg dye comes in mystery pellets. The outside color of the pellet gives you very few clues about what the dye color actually is. I ended up getting the edge of a paper towel barely-damp and making marks with them to give myself a color chart. I followed her instructions precisely, but my colors weren't as green as hers. I like aqua blue, but I wanted a blue/green combo, so at the last second I tossed a green dye tablet into the center of the pot. Um, that was a mistake. 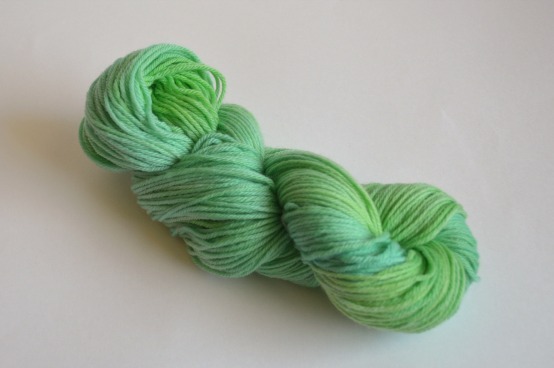 The green was a much more dominant color, and suddenly all of the yarn was green. I yanked it (carefully, so I didn't get burned) out of the pot and rinsed it as soon as it was cool enough to handle. It looked pretty enough, but as it dried, the colors lightened up a little and there just wasn't enough difference between the intensity of the shade of blue and the intensity of the shade of green. It looked flat and boring to me. Especially when I compared it to the vivid variations in my second experiment! 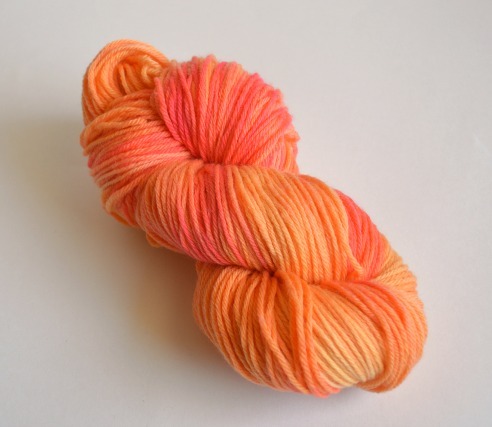 The cantaloupe colored yarn had all of the gradations of a summertime sunset, with bright pinks and soft yellows and something new for my eyes to discover every time I looked at it. I don't even particularly like orange, but I fell in love with this yarn! I wanted to fall in love with the green, but I knew it wasn't going to happen unless I did something drastic. It was so worth the extra effort. I am thrilled with how it turned out! I love it so much now! If I had know how easy it was to dye my own yarn, I would have tried this much sooner. I feel like if I have this much success with it as a complete beginner, I can't wait to see what I can create with more experience under my (crocheted) belt! I've got two more skeins of 'blank' yarn left. My mind is racing with possibilities! As a creative, crafty gal, I think that having something new to occupy my imagination is well worth pursuing. It's like planning a dream vacation, only instead of jet lag, I get new yarn!! Beautiful and creative. I can't wait to see what you will make with them. The orange is amazing! And I am not just saying that because it is one of my favorite colors, oh wait maybe I am. Great job! I may have to try dying some yarn again, I need a good rainbow. Hi There, It really does look fairly easy!!! But I am sure you'll never get the same color again!!! That's quite neat I Think???!!! One off's are nice because no one else will be wearing the same scarf???!!!! My question: will it wash out or fade after washing? Another thought: I know some people use jello to dye their hair, think it would work on yarn? Those are fantastic! Beautiful! love the colors -- can't wait to see them in person..... we on for this weekend? This is such a stellar idea! I can't wait to try it! I'm constantly running into the problem of not being able to find yarn colors that I want. This is a fantastic solution!